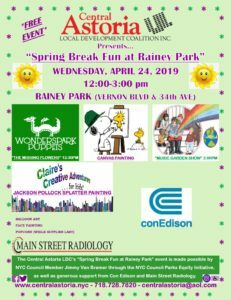 The Central Astoria LDC and NYC Council Member Jimmy Van Bramer proudly present the “Spring Break Fun at Rainey Park” event on Wednesday, April 24th, 2019 from 12-3 pm at Rainey Park located on Vernon Boulevard & 34th Avenue. 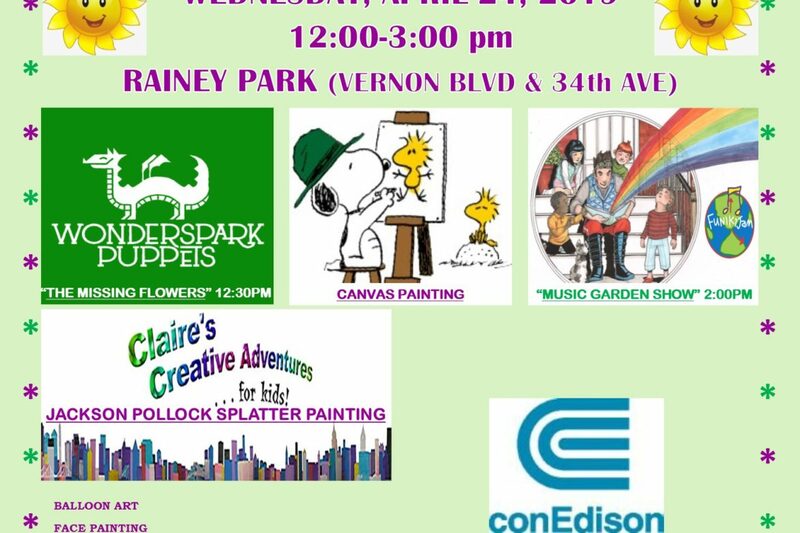 This free event is open to the general public and will feature canvas painting, splatter painting, face painting, balloon art, a spring-themed puppet show, an interactive children’s musical performance, a fun kids magic show and free popcorn giveaway. This event is made possible by NYC Council Member Jimmy Van Bramer through the NYC Council Parks Equity Initiative, as well as generous support from Con Edison and Main Street Radiology. The Central Astoria LDC also thanks the New York City Department of Parks & Recreation.